Heat a frying pan until hot and cook the lardons. Add the onions and cook for a further 8-10 minutes. During this time, roll out the pizza dough on a sheet of greaseproof paper. Make 5-cm incisions at each of the four cardinal points: at the top, bottom, left and right. Then make another four slits of the same length equidistant from the ones you just made so you have a dough with eight cuts. Place a bowl in the centre and, using it like a pastry cutter, cut the dough around it and remove this section. Cut the camembert into slices. Scatter the onions, lardons and sliced camembert over the pizza dough. Fold over the ends of each slit to make a point. Brush the dough with a beaten egg yolk. Preheat the oven to 190°C and bake the pizza star for 15 minutes. Just before serving, return the bowl to the centre. Add the mimolette sliced into thin shavings. Garnish the pizza with a few rocket leaves. Cut into slices. 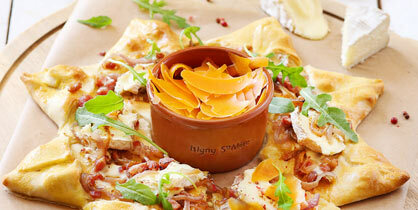 Each diner can sprinkle mimolette shavings over their pizza slice before tucking in.